The Red Empire. A Journal for MultiMedia History video review. Red Empire. Yorkshire Television, 1990 and Vestron Videos, 1992. Seven 54-minute VHS video collection. Produced and directed by Mike Dormer, Gwyneth Hughes, and Jill Marshall. 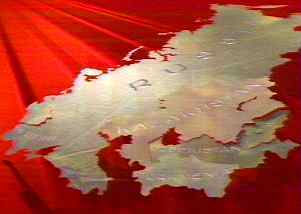 Graphic image from The Red Empire, 1939-1953. A cursory glance at the credits of the videotape collection Red Empire will tell the viewer that it was created by Yorkshire Television in Great Britain – but Red Empire is just as much a byproduct of former Soviet leader Mikhail Gorbachev’s policy of glasnost, or "openness." Having completed their filming in 1989-1990 (U.S. release followed in 1992), producer-directors Gwyneth Hughes, Mike Dormer, and Jill Marshall were able to take advantage not only of the increased access to the U.S.S.R. that foreigners began to enjoy during the late 1980s, but also Gorbachev’s personal determination—stated publicly in 1987—to compel the Soviet government and people to come to grips with their country’s checkered history. As a result, Red Empire brings to the screen interviews, film footage, and revelations about the past that were, at the time, considered by Westerners and Soviets alike to be monumental. Even now, with the U.S.S.R. defunct for more than half a decade, Red Empire, despite some weaknesses, remains valuable as a historical document and a multimedia learning aid. Red Empire is presented by Robert Conquest, one of the best-known Western historians of the Soviet Union; in addition, Geoffrey Hosking of the University of London’s School of Slavonic and East European Studies and Yuri Afanasiev of the Moscow State Historical-Archival Institute (now the Russian State Humanities University) serve as historical consultants. The tapes are narrated by actress Siân Philipps (known for, among other things, her role as Livia in the BBC’s I, Claudius series). Red Empire’s seven 54-minute volumes start with the waning years of the Romanov dynasty and take the viewer to the accession of Gorbachev in 1985. Overall, the beginning and end are handled clumsily; the material contained within is much better. Volume One, "Revolutionaries," jumps somewhat awkwardly into the last years of Nicholas II’s reign; bypassing the pivotal 1905 Revolution, the episode begins with the Lena Goldfields strike in 1912, then moves. Not until it reaches World War I does "Revolutionaries" hit its stride; the suffering of Russian soldiers at the front is made brutally clear, and the growth of radicalism back home and among the troops is explained well. The second half of Volume One chronicles the events of 1917, starting with the February Revolution and finishing with the Bolsheviks’ disbandment of the Constituent Assembly in January 1918. Given the complexity of Russia’s revolutionary process, Red Empire provides an admirable – and quite ambitious – level of detail in its overview of the party politics and personality clashes that led to the Bolshevik takeover in October 1917. From The Red Empire, 1939-1953.
short-term crises. It details the Volga Famine of the early 1920s, the Kronstadt rebellion, and Lenin’s funeral. Volume Three, "Class Warriors," leaps ahead to Stalin’s great modernizing projects of the 1928-1933 period: the "First Five-Year Plan" and the collectivization of the Soviet peasantry. This means that the succession struggle that brought Stalin to power is largely neglected, but the editorial choice here allows Volume Three to focus in depth on some of the most compelling social phenomena in Soviet history. Using interviews with factory workers, newsreels from Britain and the U.S., and conversations with American engineers who spent time in the U.S.S.R. during these years, "Class Warriors" does an excellent job of conveying the sense of pride and hope that many Soviet citizens felt as they attempted to build a modern industrial base in their country almost overnight. At the same time, Volume Three reveals the awful price that the Soviet Union paid for the advances it made under Stalin: a mushrooming system of prison-camp labor, the emergence of a production ethic that would stress quantity and speed over quality for decades, and, most of all, the economic devastation that struck Ukrainian, Kazakh, and Russian peasants during the Great Famine of 1933. As social history, "Class Warriors" is perhaps Red Empire’s most valuable contribution. Plunging deeper into the thirties, Volume Four describes how Stalin consolidated his political power – and furthered his economic agenda – by means of terror. "Enemies of the People" deals with the murder of Sergei Kirov, the Great Purges of 1936-1938, the Moscow Show Trials, and the steady expansion of the infamous Gulag system. This volume treats the actual chronology of the Terror adequately; its real strength lies in the array of personal recollections it presents to the viewer – the memories of prison-camp survivors, the reminiscences of victims’ relatives, the musings and justifications of Party faithful. Much the same can be said for Volume Five, "Patriots," which covers World War II. The actual narrative of the war is very thin: for example, the diplomatic background is largely omitted, the Battle of Stalingrad rates only a few seconds of attention, and the name of Georgii Zhukov goes unmentioned. On the other hand, the newsreels, the interviews, and the film clips are all powerful. Moreover, Volume Five makes the astute point that all Soviet citizens, Russians and especially non-Russians, were caught up in a war between twentieth-century Europe’s worst dictators – and thus in a horrible personal and political dilemma that most popular histories of WWII tend to deemphasize or neglect altogether. As the episode notes, the "Great Patriotic War" involved many different types of "patriots," fighting for many different causes. The last two episodes, "Survivors" (Volume Six) and "Prisoners of the Past" (Volume Seven), are the weakest, for the simple reason that each attempts to do too much. "Survivors" covers the period from 1945 to 1961, with fully half of that time devoted to postwar Stalinism. Khrushchev gets short shrift, and the profound effects of his Secret Speech and de-Stalinization campaign – surely the most important features of his time in power – are rapidly glossed over in favor of more glamorous material on the Space Race. Volume Seven goes on to dispose of Khrushchev – without giving much of a sense of why he was removed from power (other than to mention, but not explain, his "hare-brained scheming") – and bring Brezhnev to center stage. Overly-long and poorly-presented segments on Komsomol volunteers helping to construct the Baikal-Amur Railway and the shady practices surrounding the production of cotton in Uzbekistan impede any effective analysis of the core issues that made the Brezhnev era so famously stagnant: administrative and political corruption, the gradual boiling over of ethnic tensions in the multinational U.S.S.R., and the tremendous burden that military costs (driven up by the U.S.-U.S.S.R. missile race and the Soviet invasion of Afghanistan) placed on the Soviet economy. Brezhnev dies in 1982, Andropov and Chernenko come and go, and Gorbachev is brought to the top in 1985. Unfortunately, even though the videotape’s slipcover promises coverage of how Gorbachev has changed the Soviet Union and the world, he barely has time to shake hands with Margaret Thatcher and stroll across the screen before Volume Seven fades out with almost shocking abruptness. Given its flaws, as well as the fact that it was made some time ago, does Red Empire remain useful as a classroom tool? The answer is a qualified "yes." There are noticeable weaknesses beyond those already mentioned. Each episode manages at some point to lose the thread of its narrative. Several facts cited in Red Empire are either outdated (calculations of wartime dead) or remain a matter of scholarly debate (figures regarding lives lost during the Purges, the number of victims claimed by the famine of 1933, and so on). Those interested in Soviet foreign policy will seek in vain for any discussion of the Comintern, the invasion of Hungary, the Cuban Revolution, the Sino-Soviet split, or the arms race with America. Finally, for a collection purporting to tell the entire story of the Soviet Union, Red Empire lacks proportion and spends far too little time on developments in the USSR after the death of Stalin. 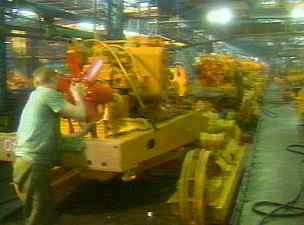 Cheliabinsk tractor factory worker at work. 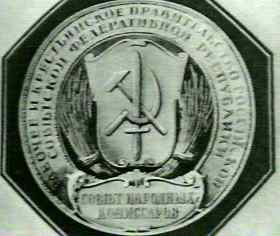 A frame from The Red Empire, 1939-1953. Nonetheless, there is much to like about Red Empire as well. Given the highly-politicized nature of Soviet-studies scholarship in the West, the producers have done an excellent job of piecing together a picture of Soviet history that is free of ideological prejudice or polemical harshness. More so than most documentaries on the U.S.S.R., Red Empire communicates the essential fact of twentieth-century Russian history: that the Soviet experiment was motivated by, and gave birth to, powerful dreams and laudable hopes, but that it also corrupted and betrayed those very same aspirations. The film footage and newsreels are, on the whole, well-chosen. The real treasure, however, is Red Empire’s collection of interviews, which represents an oral-history coup (carried off at just the right time, before many of the people who participated in the key episodes of Soviet history go the same way as the Soviet Union itself). Gathered together are ordinary workers, soldiers, and citizens, but also notables such as dissident Lev Kopelev, peace activist Sergei Kovalev, author Andrei Sinyavsky, and Tanya Litvinova (daughter of foreign-affairs commissar Maxim Litvinov). More than anything else, the stories these people have to tell – a Civil War veteran remembering with glee the boots he plundered from a White supply cache, a Ukrainian peasant woman weeping over the son she lost to the Great Famine, Cheliabinsk factory workers describing how deliriously proud they were to have produced their first tractor, a female pilot captured by the Nazis recalling Stalin’s unforgivable policies toward Soviet prisoners of war – breathe real life into the Soviet experience. Although Red Empire is best used as a supplement to more detailed classroom discussion of the U.S.S.R.’s narrative history, its videotapes can be, in that capacity, very useful indeed. Video Review of Red Empire Copyright © 1998 by the Journal for MultiMedia History.